• rinse and soak the lentils in enough water overnight or for 8-9 hours. • drain and then add them in a pressure cooker. • add 4 cups water and pressure cook on high or medium flame for 12-15 whistles. • when the pressure settles down on its own, remove the lid. • drain the water and rinse the lentils. • put back the lentils in the pressure cooker. • add 4 cups fresh water, tomato puree, butter or oil, garlic, red chili powder, cream and salt. • stir and mix well. • pressure cook again for 12-15 whistles on a medium to high flame. • when the pressure settles down on its own, remove the lid and check the lentils and the consistency of the dal. • the lentils should be completely cooked and mushy. • now simmer the dal without any lid on a low to medium flame, till the consistency becomes medium and smooth. • mash some lentils with the back of a spoon to thicken the dal. • the lentils should become so soft, that they should melt in your mouth. • check the seasoning and add more salt or red chili powder if required. • simmer for 15-18 minutes or more till you get a creamy smooth consistency like the way you see in the dhabas and restaurants. • serve the dal makhani hot plain or topped with some butter or cream along with rotis, naan, paratha or plain or jeera rice. 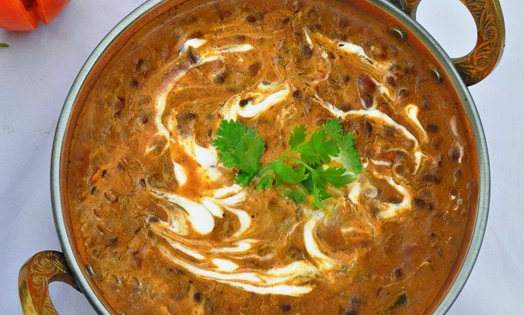 1. the consistency of dal makhani can be easily adjusted by adding more or less water. 2. if in the third stage of cooking the consistency becomes thick, add some water.